We would like to thank everyone who donated to the Loukoumi Make a Difference Foundation, as we explained this donation goes to St. Jude Children’s Research Hospital. We would also like to thank all of our students for making cards to send to the patients, they did a wonderful job and we know the patients will truly appreciate it! If you have not donated yet please do so by Monday, October 29th. We had asked the children to donate $1 to show that every dollar makes a difference, “no good deed is too small and together we can make a big difference”. Please be advised that a decision has been made today by the Office of the Superintendent~Catholic School Support Services to administer the Grade 7 ELA and Math tests in the Spring of 2019 and eliminate testing -Grade 8 ELA and Math. However, the diocese will continue to administer Science in Grade 8. Stages On The Sound begins Monday, October 22nd! 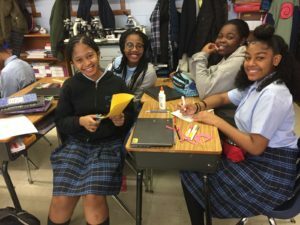 Stages On The Sound is in its 10th year of school residencies and theatre programming aimed specifically to serve students in the Brooklyn Diocese. Our 4th grade classes will be making Stop Motion Animations as their final project. We’ll be focusing on games and exercises that explore storytelling, visual literacy, and collaboration within groups. Students’ final film project will be centered around a topic they are currently studying; helping connect the arts in a cross-curricular fashion. Our 6th grade class focus will be Writing For Performance. Students will be exploring storytelling, story structure, and forms of writing for performance including both poetry and scene work. Their pieces will be presented at the program’s conclusion; reinforcing good public speaking habits through performance. Students final projects will also be centered on topics studied in 6th grade. Our 8th grade class focus will be William Shakespeare’s Julius Caesar. Students will learn text analysis and critique, story, character creation, and rehearsal and performance techniques. Students’ final projects will be selected scenes and monologues from the play. Thursday, September 13th, is our back to school Parent Orientation for grades K to 8! Just as a reminder, this Thursday, September 13th, is our back to school Parent Orientation for grades K to 8. We will begin with a general meeting in Coyne Hall at 6.30 p.m., followed by an orientation by your child’s teacher. At this time, the teacher will let you know what his/ her expectations and procedures are for the year. All studies show that there is a correlation between a child’s academic success and parental involvement. Therefore, I ask you to make it a priority to attend the Orientation. The school year calendar will be distributed on Thursday evening. Please note, monthly paper calendars will not be sent home; any updates to the calendar will be made online. You will also receive the Parent/Student handbook as well. Option C logins have been given to the students. As a partner in your child’s education, you are expected to regularly check your child’s progress on Option C.
Thank you for a wonderful beginning to the school. I look forward to seeing you on Thursday.